Interesting approach! I agree about not using backpacking food, expensive and way too much salt. One wee suggestion for improvement, Chris. I note you bought Marvel milk powder. One item that is worth stocking up in advance of a trip is East End Milk Powder. It's full fat milk, and it's absolutely delicious. Porridge becomes a treat from heaven. Give it a try. You won't regret it! I mix some instant custard powder and some dried blaeberries with one of the Quaker 2-minute Golden Syrup porridge sachets and the East End milk powder, and believe you me, it's the best start to the day you can have! Thanks Andy. I must admit I haven't come across East End milk powder. I'll look out for it. Hi Chris, it's rowena, i will get you some if i see it, probably needs to be from a large asian shop. Thanks Ro. 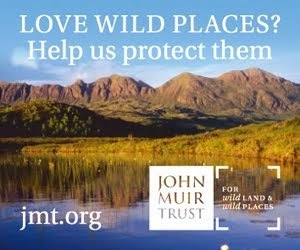 I haven't found any locally but then there's not many places to look. Glad to see the pasta and sauce and super noodles in there. A fraction of the cost of expensive dehydrated meals and just as tasty. The Dolmio stir in sauces are quite good as well. I get Nido milk powder from a local Asian supermarket and this tastes just like real milk also. 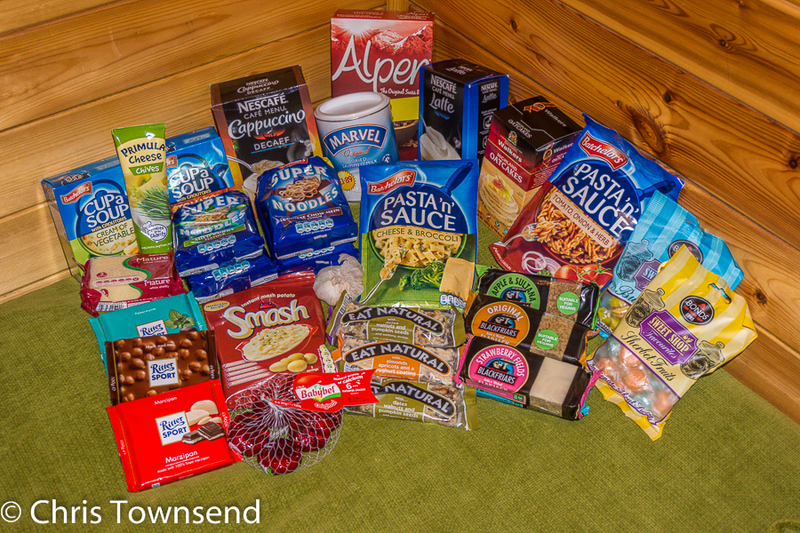 Tony was amazed you could just walk into a shop and buy a weeks load of food for backpacking! No other option many years ago and so much easier than sending food ahead. Looking forward to hearing all about the walk. Tesco stocks the East End dried milk from time to time, Chris. That's where I get it from. It's really scrumptious! I haven't seen it in my local Tesco's (Aviemore). But then I haven't looked for it as I didn't know it existed! I'll check next time I'm there. Can't remember how big the Aviemore Tesco is. I found it either on Tesco online or in the large Tesco shops in Dundee and Perth. Good luck! Maybe if you ask customer services they can get a few packets in for you. It's seriously yummy! Thanks Chris for posting this, it is interesting to see foods I recognise from previous forays into the UK. Being able to walk into a shop and resupply certainly has its advantages on a long trip, though sometimes as you note the variety may be limited. I use Nido with porridge, fruit and sugar and love it, and I like Andy's suggestion of custard powder, I must try it. On the cooking front, the 600 ml pot nests inside the 900 ml pot, and I assume the sidewinder is for the 900 ml pot and wondered does it nest inside the 600 ml pot? Or do you carry it elsewhere? The pots will nest inside the Sidewinder but I found that leaves them smelling of fuel so I soon stopped storing them like that. Instead I use the plastic container supplied by Trail Designs - you can see the corner of it in the picture. The milk ideas are interesting. Angel delight, mixed with protein shake good too!. "Sophisticated back country cooking. 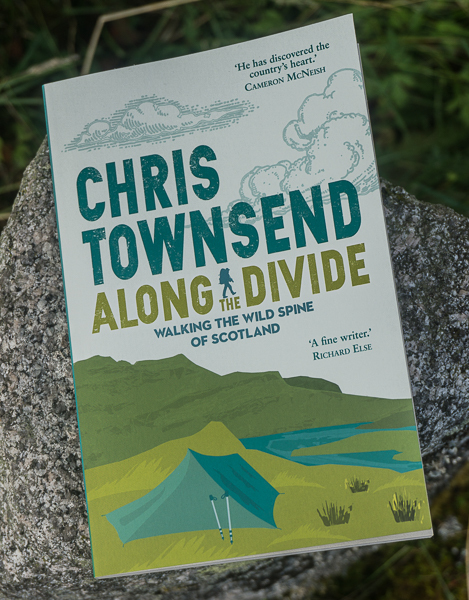 Pour in two packets of cup-a-soup and stir..." Chris Townsend, 'The Cairngorms in Winter'. We'll need to ensure bachelors sponsor the next film Chris! Ha. Useful, thanks Chris. I agree about trying to stock up from local shops along the way. I do hate boughten dried meals though ... am considering getting a dryer and drying up my own veg and meat/jerky. I worry a little bit about some of the cheaper backpacking food options available from supermarkets as well as some popular bespoke backpacking food products on sale that contain hydrogenated fats. These have been banned in some countries. I remember reading that they contribute towards clogging of the arteries. Mike Stroud wrote a good book Survival of The Fittest that goes into detail about this, and nutrition for endurance activities. I would like to carry only chocolate flavored food when go outside for long vacations with family. Chocolate benefit is that it gives our body energy,strength,proteins,nutrients and everyone likes to eat it. Anyway i will also carry some item which you suggest in this post hope it is also helpful for me in my next trip. That's a very interesting a good post, as the normal backpacking food are expensive. What I have been doing lately(though I've never done anything as long as any of you here) is get some packs of either biltong or jerk beef(Can't get away from my meat) with sachets of soup, wine gums, always supermarket foods. Oven bags are really useful: not likely to melt or leach chemicals like freezer bags. Meals based on oats, noodles or couscous can be prepared in advance. Often boiling water can simply be poured in, but a little hot water in the pan can be used to heat up bags of slower-cooking food. No washing up, unless you want to use them more than once. When ready, cut off top of the bag for easier eating. Message to Andy, is the East End Milk powder suitable to be used for tea and coffee? 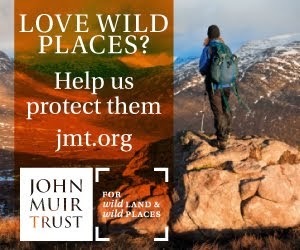 Cool topic I'm off for 8 days across Cumbria's hills and came here for some tips on food choice. Does anyone know of any foods that are not dried to add water and can be easy prepared ? Something meaty and rustic I don't find myself satisfied on pasta. Another thumbs up for nido full fat milk powder. I found it in the aisle in Morrison's which has things for people from other countries (calling it the immigrants aisle feels wrong - but it's different to the 'world foods aisle!' 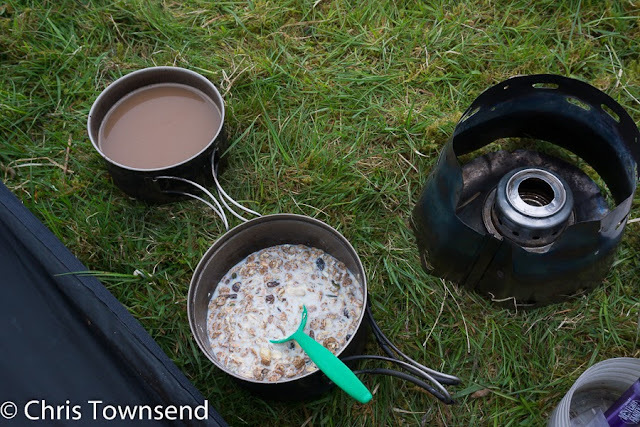 mixed with red box alpen (the added sugar one) it kept me and my kids happy along the Hadrian's wall trail. I find the difficult thing is sourcing protein. 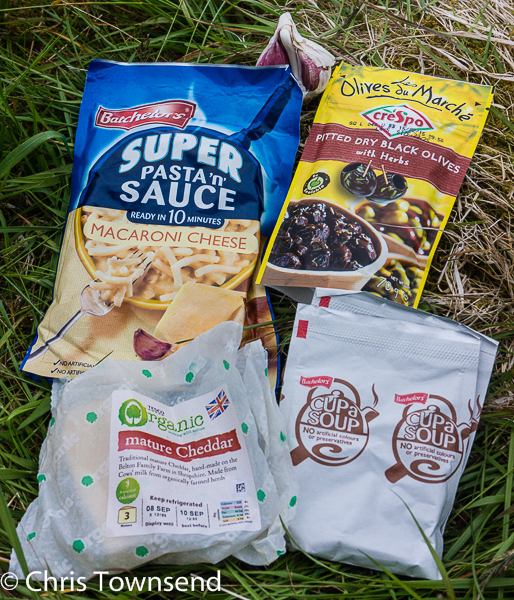 I am a bit freaky about eating cheese etc which hasn't been refrigerated - no worries about germs but I am just fussy.....however, I used to train a lot and hike a lot, and I find lower protein (noodles, oats, etc some protein but not good quality or bit quantities) spells tiredness and lethargy. I would recommend protein powder/whey even milk and egg powder. Works out about 70p per shake, mixes with water (you can chuck oats, seeds, fruit, anything in) and can be mixed in a shaker which is light and useful for other things (will need to be cleaned though). You can get a neutral flavour like vanilla which combines with cocoa, put it in porridge.....and it's the finest protein source money can buy, except possibly for fresh eggs. I think it got one shout above and I must echo that, it's very good for you, cheap, delicious and very light. I 'dehydrate' (i.e. cook 'til crunchy) bacon in the microwave - just stick it between two sheets of kitchen roll and keep microwaving in short bursts until done. Then out on the hill I put it in the water to rehydrate as it boils before making up instant noodles/pasta'n'sauce/etc. The 'just add water' meals are lacking in fat so an individual portion of garlic butter added makes a big improvement to taste - and calories. Really helpful articles everyone. 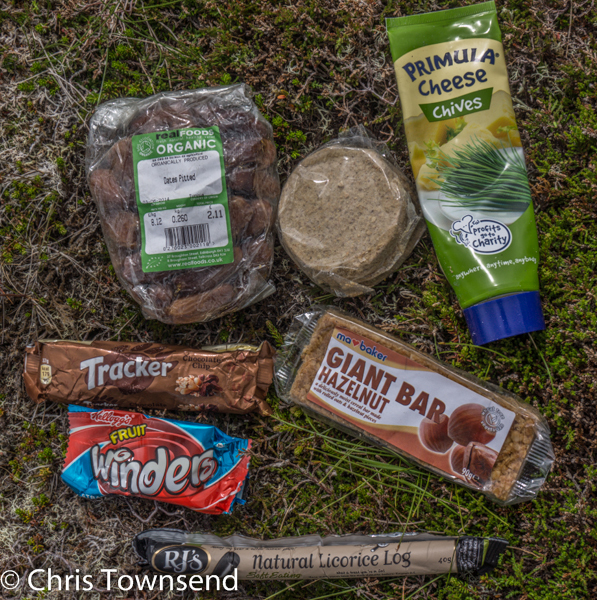 I'm just off to the Lakes for 4 days of wild camping so I need to take all of my food with me. Based on these articles I have been to Tesco and found plenty of lightweight meals that require nothing more than the addition of hot water (which is good because that's all I'll be able to "cook"). Tesco have a huge selection of curries, pastas etc that fit the bill including a 3 minute Udon Noodle pot from the restaurant chain ITSU which looks a step up from the usual pot noodles and costs £2 at the moment. I'll let you know what its like. Thanks to Chris and everyone else for the suggestions. Gary.